A phalanx of windmills guards the border between Colorado and Nebraska. Visible for miles on the treeless high plains, the giant turbines appear to inch closer as cars approach the state line at eighty miles an hour. The windmills embody differences in political culture between the two states. Conservative Nebraska has until recently done little to encourage the harvesting of its howling winds. 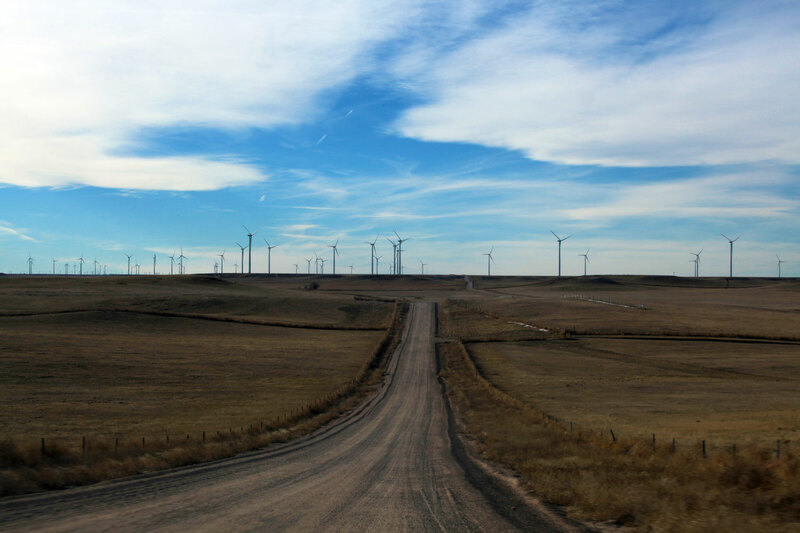 Colorado, with its ridged plateau and peculiar admixture of libertarian, liberal, and green sensibilities, has installed enough turbines to power 800,000 homes. The stark contrast between the two states evident in above-ground development masks a literally deeper similarity. Underground on both side of the border, an estimated 150 nuclear missiles remain on hair-trigger alert. 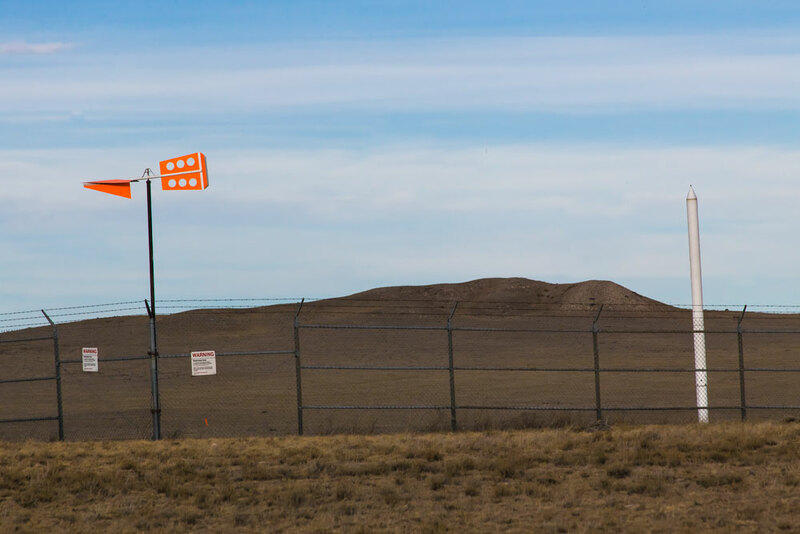 Affiliated with Warren Air Force Base, just across the Wyoming border, each two-acre missile site is cordoned off by an unremarkable square of chain link and marked by a single white pole. In underground launch control centers, teams of missileers wait, as they have for fifty years, for a presidential order to launch nuclear Armageddon. While most people hope the underground missiles never see the light of day, opinions are far more divided on another material also trapped beneath the surface of the earth. Hydraulic fracturing – better known as fracking – is a booming business on the high plains. The practice involves drilling deep wells, first vertically and then horizontally, and then priming them by injecting a high-pressure mix of water, sand, and a propriety mix of chemicals to fracture the rock and release trapped natural gas. While first practiced in the Colorado gas industry in the 1970s, virtually all new oil and gas wells today use hydraulic fracturing. And there are a lot of them – 2975 well starts in 2011 alone. Recent months have seen the publication of troubling studies associating Colorado’s frack fields with increased rates of birth defects, cancer, and endocrine-disrupting chemicals in the water. Nevertheless, the oil and gas industry remains central to the Colorado economy and a major force in state politics. When the city of Longmont voted to ban fracking in 2012, Democratic governor John Hickenlooper sued.1 Despite the governor’s public threats to keep the lawsuits coming, three towns voted in November 2013 to ban fracking or drilling expansion in their jurisdictions. In this remote stretch of the Colorado high plains hugging the Wyoming and Nebraska borders, there are few residents to pass fracking bans. In fact, much of the land here is owned by large ranchers and managed by the federal government as part of the 193,000-acre Pawnee National Grassland (PNG). Notwithstanding the park-like US Forest Service (USFS) signs upon entering the grassland, there is no mistaking this for anything but a working landscape. In addition to towering windmills and subterranean missiles, the grasslands are in the midst of a natural gas boom. On any given day, oil industry workers seem to outnumber hikers and picnickers by a margin of at least ten to one. Construction trucks rumble over the hard-packed gravel roads, kicking up clouds of dust as they pass. Drilling platforms, pipes, and storage tanks spring up seemingly overnight. 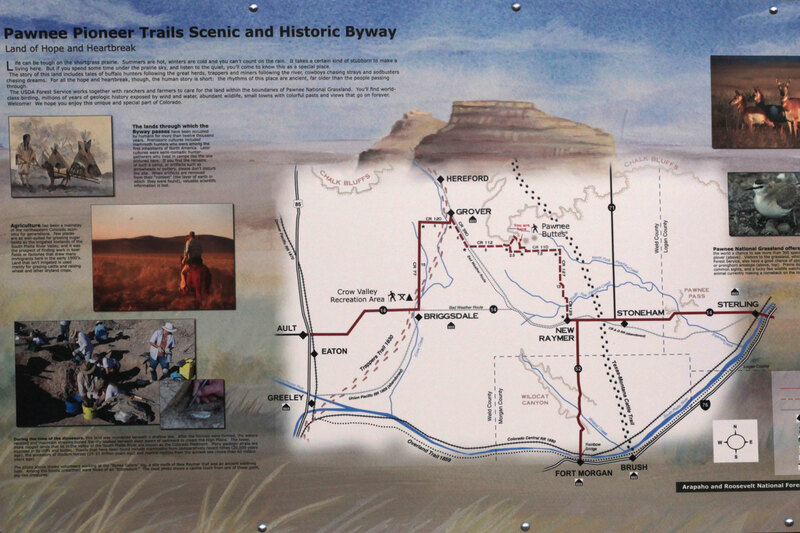 Although the most popular recreation spot on the grasslands – the scenic Pawnee Buttes – is protected, drilling rigs on adjacent, privately owned lands are visible enough to warrant an interpretive sign. The beep-beep-beep of service trucks rumbling in reverse mingles with birdsongs and the legendary plains wind. At dusk, well flares twinkle on the horizon like fallen stars. Whether the Forest Service agrees that the odd combination of wind power, fracking, and ICBM missiles “best meet the needs of the American people” is something a moot point, however. Property lines and jurisdictional boundaries mean that the agency’s authority over development in the grassland is actually quite limited. 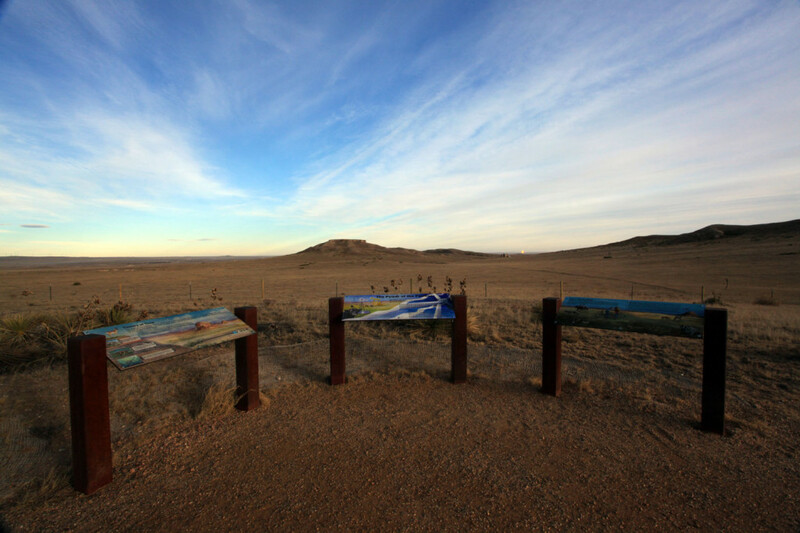 The grassland is a patchwork of federal, state, and private land, and federal mineral rights are the purview of the Bureau of Land Management (BLM). Sixty-three vertical oil and gas wells currently operate on the Pawnee National Grassland, with more explored every day. Twelve active nuclear missile silos lay buried in the eastern half of the site. 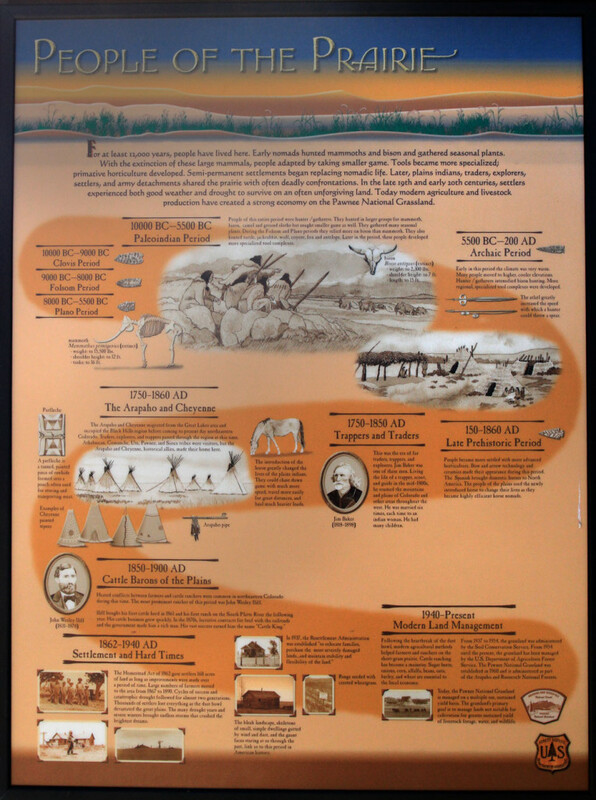 Other structures on the grasslands include the ruins of ranches and towns that boomed and then were quickly abandoned in the rush of Westward Expansion and the ecological collapse that followed. These manmade structures, not to mention the grasslands conservation program itself, stand as monuments – some living, others dead – to coexisting and sometimes clashing visions of “needs of the American people.” Indeed, what it means to be ‘American’ and a ‘people’ were forged in part by the multiple practices and many decisions that produced this landscape. Here, the land is quite clearly bound up in different, ragged and overlapping stories of ‘national security’ – stories that began long ago but are certainly not yet complete. The interpretive and promotional texts surrounding the grassland reveal that the very first national security project – the expansion and consolidation of the nation itself – is an ongoing affair, requiring constant reinscription. They also demonstrate, albeit obliquely, how the land has long been bound up in practices of “environmentality:” the construction and administration of the environment through the action of government, the production of expert knowledge, and the cooperation of corporate and individual actors. The conversion of western land into settled, private property was an eco-governmental project, initiated by treaties that first established (and then ignored) tribal boudaries, accelerated by the Homestead Act, reinforced by Indian allotment policies, promoted by railroads, and managed through laws regulating public grazing lands.5 When rain failed to “follow the plow” as expected and the area was devastated by Dust Bowl conditions, the New Deal stepped in with plans “to relocate families, purchase the more severely damaged lands and exert influence on the use of the neighboring land, and maintain stability and flexibility of the land” (Bankhead-Jones Farm Tenant Act of 1937). While designed to make existing grazing practices more sustainable, New Deal programs resulted in many cases in settler dispossession (albeit at some level of compensation) as smaller farms gave way to larger tracts of cooperatively managed grazing lands. The population of the grasslands, never large and subject to wild swings, dwindled still further. Better maps indicate not just the outlines of the grassland but also the peculiar patchwork of Forest Service, US Air Force, and private ranch lands that compose it, but the casual visitor would be hard-pressed to discern jurisdictional boundaries or property lines in the landscape. Rusty barbed wire rims all the roads; tires rumble over cattle guards every few miles. Though handful of large ranches still operate, it’s hard to tell where private land ends and public begins. The pronghorn, mule deer, prairie dogs, and rabbits that can be seen leaping over the short tufts of grass have no doubt developed their own methods for determining where is safe to travel, where to make their homes, and how long is best to stay. In the late 1950s and early 1960s, as the the multiple use, sustained yield concept came to define the management of domestic conservation lands, the nuclear arms race largely animated US foreign policy. Air Force experimentation with solid-fuel rocket technology — the stability of which allows missiles to be placed on alert for long periods with minimal maintenance–came to fruition in 1959 with the first successful launch of a missile from underground storage. By the time Rachel Carson’s Silent Spring was published in 1962, ten silos housing the first generation of solid-fuel inter-continental ballistic missiles (ICBMs) came online. By 1966, 1,000 silos had been constructed and missiles deployed. Although the environmental movement is imagined as reacting to the ecological excesses of American consumer culture, its simultaneous birth with the most destructive weapons the world has even known has recently been receiving greater scholarly attention. Cold War strategists considered the environment a potential military front, but both horror at the planetary impacts of nuclear weapons and unplanned effects of military technologies have been enormously influential in forging a popular environmental consciousness. The military ‘sustainability’ of solid-fuel ICBM rockets on long-term alert may clash with today’s image of green sustainability, but it can be taken as an ironic reminder to question what is being sustained, for whom, and at whose expense. The weapons waiting beneath the Pawnee National Grassland are the third generation dubbed “Minuteman” after the famous colonial militias known for fast responses to British aggression. With a range of 7,000 miles and capable of releasing three, independently targeted, guided warheads, they are scarcely defensive in nature. Lest it seems a Cold War relic, the Minuteman III program is, by Congressional mandate, slated to continue until at least 2030. With a recent RAND Corporation report that further maintenance of the Minuteman system would cost a fraction of the development of a new nuclear missile program, it is likely that Air Force will continue its program of “stockpile stewardship” indefinitely, testing aging propulsion systems, replacing components as necessary, and upgrading computer systems. These tasks are not without challenge: the original computers that guided the missiles ran on magnetic tape and had a tiny fraction of the power of a first-generation iPhone; the engineers who developed the systems are well beyond retirement age; and the daily work of a missileer engaged in what the Air Force calls the “sustainment” of the ICBM force has got to be one of the dullest tech jobs in the world. The isolation, stress, and boredom of the work no doubt contributing to a recent drug and cheating scandal that resulted in the firing of nine air force commanders. That nuclear missiles first deployed in the 1970s persist into the drone age is a reminder that technological eras overlap and merge. The remote launch and guidance systems built for the ICBM program directly contributed to the development of unmanned aerial vehicles. Drones themselves grew out of the 1960s Drone Anti-Submarine Helicopter (DASH) program – small, unmanned anti-submarine helicopters deployed on Navy destroyers and capable of nuclear payloads. The high rate of failure and loss in the DASH program resulted in its closure, and the continued tendency of today’s drones to crash (there were 22 crashes in 2013 alone) may account for the Air Force’s recent announcement that it does not intend to pursue nuclear-equipped drones in the immediate term. However, Sandia National Laboratories and defense contractor Northrup Grummond have drawn up initial plans for nuclear-powered drones, believing them to be a solution to the limited range, power, and flight time of conventional drones. No doubt such drones would face significant political opposition over safety concerns, but much as climate change has caused many to take a second look at nuclear power generation, the use of drones for long-term environmental monitoring may well eventually green the image of nuclear-fueled UAVs. Considering the history and possible futures of nuclear missile technologies in this way allows the presence of ICBMs on conservation lands to seem less an aberration and more a co-incidence that might shed some light on how the military and the environment are profoundly intertwined. If government action actively produces certain visions and kinds of nature, the military participates in eco-governmentality, too. The national response to environmental catastrophe has been thoroughly militarized: Anne McClintock argues that the BP Deepwater Horizon oil spill in the Gulf of Mexico in 2010 is perhaps the single clearest example of eco-militarization. Even as the Republican right refuses to acknowledge global warming and stymies all legislative efforts to address it, the Pentagon now describes climate change as a “threat multiplier” that must be integrated into all defense considerations. Under these circumstances, the military may well end up the arm of the government most prepared for the ensuing climate chaos, with profound effects on how problems are framed, how communities are organized (or not), and how adaptation is implemented. Although the military has cast itself as environmental steward (through the work of such groups as the Army Environmental Policy Institute, for example), the Pentagon has an outsized impact on the environment, standing as the single largest global emitter of carbon dioxide and generating as much toxic waste as the five largest chemical companies combined. During the younger George Bush administration, the Pentagon lobbied hard for blanket exemption from most domestic environmental laws. Although the effort was ultimately unsuccessful, the military receives almost every exemption it seeks and enjoys a blanket release from all international climate agreements if national security might be affected. Even President Obama’s 2009 executive order curbing government carbon emissions include provisions by which the military can exclude itself from the targeted reductions. The exceptional presence of ICBMs on the Pawnee National Grassland, then, materializes the state of exception that characterizes the military’s relationship with, and authority over, the environment. The checkerboard ownership patterns that allow ICBM silos beneath the Pawnee National Grassland also afford the operation of the largest windfarm in Colorado. Built entirely on private and state-owned (but not federal) land, Cedar Creek comprises nearly 400 turbines with a generating capacity of 550 MW – enough to power more than 90,000 homes. With the population of Colorado booming, the windfarm goes a long way to meeting the state’s goal of 30% renewable energy by the year 2020. The Cedar Creek project was spearheaded by BP Wind Energy and is jointly owned by BP, Australia’s Infigen Energy, and the San Diego-based Sempra Generation. According to BP, the siting within the national grassland is purely for technical reasons: there’s a lot of wind, few buildings, and even fewer trees. The companies negotiated leases privately with landowners and the state of Colorado to put up the turbines. Although the turbines are located entirely within the boundary of the grassland, Forest Service had no input on the siting and approval of the wind farm because it is avoided any federally-owned land. The cooperative management and conservation mandate of the grassland notwithstanding, the Forest Service was considered nothing more than a neighboring landowner. Although Cedar Creek is adjacent to important bird nesting grounds, and with research raising questions about the effects of turbines on bird populations, the Forest Service was neither approached nor asked by the company to weigh in. Instead, it was the Nature Conservancy, a private nonprofit, that raised questions about the impact on birds. BP ultimately donated $75,000 to the Conservancy during the construction of phase one to purchase conservation easements to offset the project’s potential disruption of bird nesting habitat. Concerns over wind farms’ effects on birds can be put into perspective by considering the astonishing number killed annually in the US by collisions with buildings (100-900 million), encounters with housecats (1.3-4 billion), and the catastrophic effects of climate change that wind power might mitigate. With recent estimates of bird deaths from wind turbines at less than 600,000 per year, the issue has not gained much public attention beyond ecologists and bird-lovers. More often, public concerns center around the aesthetics of the development. According to the Forest Service, some visitors at Pawnee feel the windmills mar vistas of the famous buttes; others see them as inspiring signs of environmental progress. Both positions channel longstanding tensions between the romantic and the utilitarian that have long shaped American environmental discourse and policy. But both also perceive the grassland primarily as an image rather than a living and ever-changing assemblage of wind, land, organisms, law, policy and property. 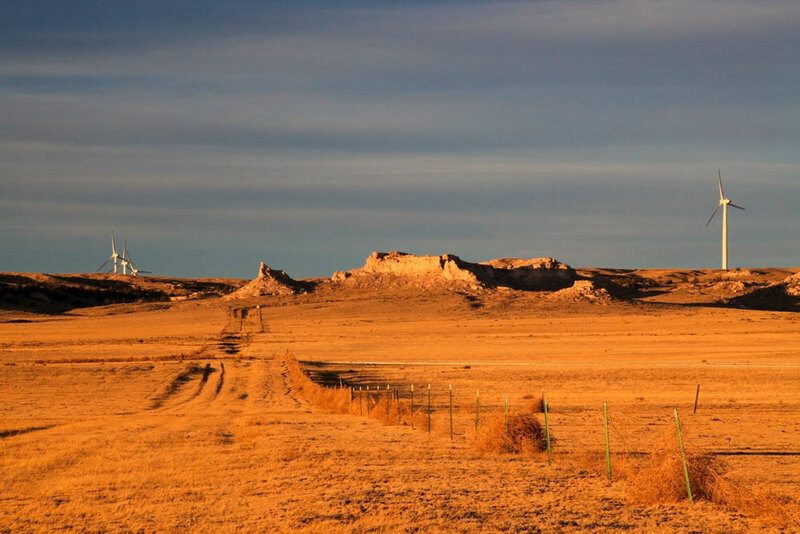 The persistence of private property on Pawnee – created by governmental action involving the removal of the Cheyenne and Arapaho and redistribution of their land – makes its management as a truly ‘national’ grassland something of a challenge. As the example of the Forest Service having no say in the siting of the wind farm suggests, private property rights usually trump all other interests, unless those interests (e.g. clean water) are explicitly protected by law. If these exceptions prove the rule, it might be more accurate to say that the overweening national interest is the protection and perpetuation of private property rights, with all else an addendum. Of course, property lines mean nothing ecologically, and ecosystem approaches to land management very often falter on exactly the same logic that left the Forest Service out of the room when plans for the Cedar Creek Wind Farm were laid. While the Forest Service may have asked for some modifications to the wind farm plan, they would be extremely unlikely to oppose it. Their mission, after all, is to manage land to ‘best meet the needs of the American people,’ and renewable energy is, at this point, nearly as uncontroversial a need as can be described. Far more controversial is the practice of hydraulic fracturing for oil and natural gas development. Not only do surface property lines affect the ability of the Forest Service to weigh in on development decisions, but the surface/subsurface “property” line places all below-ground development also out of their purview. Almost a third of PNG has privately-held mineral rights; another third has mixed federal and private rights. Mineral rights on the remaining 40% of the grassland are entirely federal and administered by the Bureau of Land Management (BLM). The Forest Service has absolutely no authority over privately held mineral right development but can work with the BLM in a consultative capacity to review effects on surface ecology and resources. This process has explicitly protected fewer than 3,000 acres from oil and gas drilling, with another 14,000 available with the stipulation ‘no surface development.’ This means that more than 90% of the surface grassland is open to oil and gas extraction without restriction. If this fraction seems extreme, the rapid rate of oil and gas development on large parts of the grassland has prompted the Forest Service to pursue a new environmental impact analysis. Underscoring the limited scope of USFS jurisdiction, the goal of the project is, rather modestly, to analyze the effects on surface resources and to “provide recommendations for mitigation of unacceptable effects.” The project is currently underway, with a public comment period opening this summer. In comparison to the dusty and noisy oil and gas fields just to the south, the Cedar Creek Wind Farm seems like a 62,000 acre green energy haven. But the companies that operate it may be hedging the climate change bet. While Australia’s Infigen specializes in renewable energy exclusively, Sempra and BP combine extensive holdings in fossil fuel infrastructure with investments solar and wind. In the absence of a consistent national energy policy, fossil fuels are still the bulk of the US energy market, and their infrastructure is very much expanding. For example, Sempra Generation is a major investor in natural gas pipeline and storage facilities in North and South America. Its 1,700 mile “Rockies Express” natural gas pipeline opened just to the north of Cedar Creek in 2009, with a spur connecting PNG natural gas to national distribution. 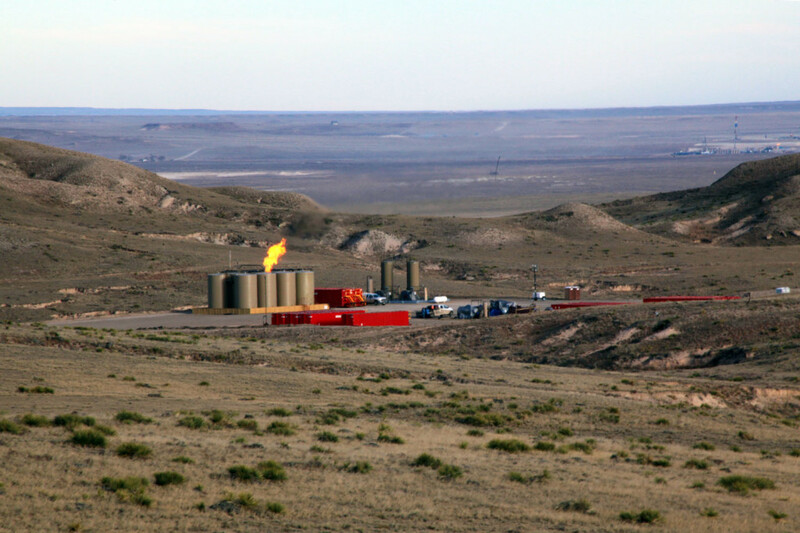 Incidentally, the Rockies Express pipeline begins in Rio Blanco County, CO – site of one of the first Project Plowshares experiments designed to judge the feasibility of detonating nuclear bombs to stimulate natural gas production from deep underground wells.8 Hydraulic fracturing is today’s answer to the same technological question, demonstrating again continuities between old and new technologies and between national security and energy security. Both natural gas and renewable energy development are surging in Colorado as the state’s population and economy grow. Although natural gas is cleaner burning than coal in terms of CO2 emissions, it is not really a ‘green’ energy, especially when the water, geological disruption, and potential chemical contamination of the hydraulic fracturing process are taken into account. The corporate lawsuits against communities’ banning fracking cite limits to local jurisdiction and invoke private property rights in ways familiar from the management of energy development on the Pawnee National Grassland. While these issues play out across the state – and the country – the peculiar mix of land use and ownership at the PNG allow them to be seen clearly and in microcosm. Unruly, distinctly un-pastoral conservation sites like Pawnee put into stark relief the layers of history, ecology, governmental action, law, culture and land use that, through their cooperation as well as conflict, produce landscapes both extraordinary and quotidian around the world. ‹ First Charrette Report Released!